This is a Grammy-award nominated story that is masterfully done by the folks at Rabbit Ears. Danny Glover’s raspy yet calming narration and Taj Mahal’s solo guitar music helps complements the story of those two tricksters, Brer Rabbit and Brer Fox. Danny Glover does a great job at narrating this story as he provides inflections throughout the story such as going deep when he does Brer Fox and going high-pitched when he does Brer Rabbit. Danny Glover’s narration is calm and energetic and makes this story great to listen to on the ears. Taj Mahal’s solo guitar music is excellent as the music greatly matches the story’s calm mood and southern roots. Although, I found nothing inappropriate about this story, I felt that Henrik Drescher’s illustrations were a little awkward for this story. Since, the mood of the story is calm and sweet, Henrik Drescher’s illustrations are a bit wild and blunt and the illustrations usually take the attention away from the main story. I did not like how the contraption came to be as it looks like a black jug that has wobbly legs attached to it instead of an actual person, which is normally seen in the other versions of this story. 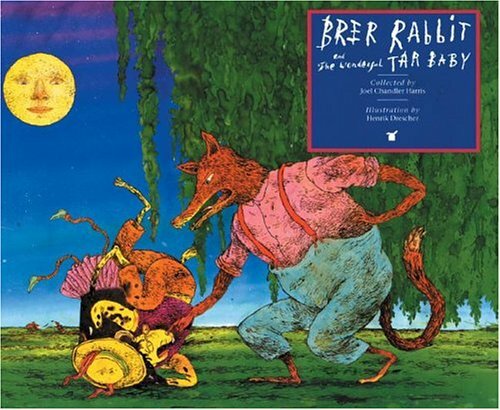 Overall, this is a great story that fans of the Brer Rabbit would greatly appreciate. Both Danny Glover and Taj Mahal make a great team at providing the southern theme for this story. However, the illustrations may need to be improved to match the mood of the story.